This blog on how to save electricity was written and published in May 2015. All the information in the blog is still valid, we have just decided that we would like to add a few more tips on how to save electricity in your home from from Jason, a Brisbane electrician and owner of Globe Electrical Solutions. Firstly you might want to look at this info graphic produced by the South Australian Government on home energy use. 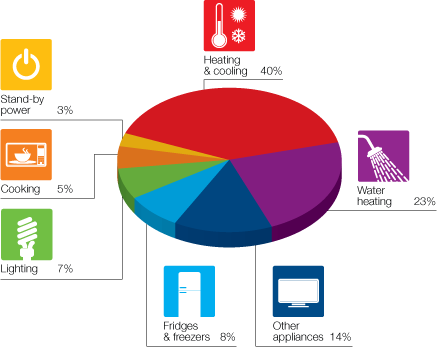 As you can see from this image, heating and cooling are what we use most of our electricity on. Thus this area (heating and cooling) must be a major area to target when trying to save electricity use in the home. There are many ways to save electricity in your home, and thus also reduce your electricity bills. Some are obvious, some not so obvious and some require an investment for the future. A very obvious tip is to turn anything off that you don’t need on. Whilst pretty obvious people often don’t think of using just a bedside lamp for example rather than lighting the whole bedroom. You should change as many of your old light globes that you can to compact fluorescent ones or if possible LED globes. Please use your clothes dryer as little as possible, these appliances really use a lot of electricity and we in Brisbane have a great deal of natural sun light to dry our clothes in summer and even winter. When washing clothes it is best to always do a full load and also to use a cold water wash.
Have shorter showers and use water efficiency shower heads, they save not only on water but also on electricity. Replace old appliances when they fail with new energy efficient appliances. Timers are becoming more common place and so they should. Using timers not only saves you on electricity but are a very good form of security. Check that older appliances such as refrigerators and ovens still have very good sealing to keep the cold or heat in. If this sealant is not working properly it can add to your electricity bills. Skylights can provide a wonderful source of natural light into your home. Not only do skylights lighten and brighten your home but they also add value to your home in terms of resale value as a lighter, brighter home is always more attractive to potential buyers. If it is time to repaint the interior of you home chose light and bright colours. This will help reflect the natural light that comes into the room and also make you rooms appear larger. Using ceiling fans together with your air conditioning can help reduce your electricity bill. It seem really strange to put on a fan in the cold of winter, however ceiling fans will drive the hot air downwards thereby reducing the need for high setting of reverse cycle air conditioners. Most ceiling fans have a winter and summer switch, so take advantage of this excellent and free way to save money on electricity. According to the Australian Government in an article entitled Renewable Energy one way to reduce energy consumption is to replace high energy use items with a different source of fuel such as LPG. The items that they identify as having the potential to be replaced to function on LPG include water heaters, room heaters and ovens. 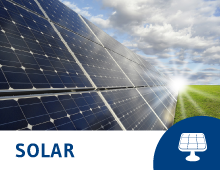 The best advice we can give you if you are looking for a significant and ongoing long term way to save on your electricity bill is to engage a solar electrician to install a solar panel system for your home. Another sure long term electrical saving is to have insulation in your home, or at least in your roof. Insulation in your roof is not that expensive and is very effective. For installation in your walls this can easily be incorporated when building a new home and should also be considered in refurbishments of homes such as replacement of cladding. At the start of this article we determined that heating and cooling were where we Australian’s we using most of our electricity. Our hot, humid summers in Brisbane and further north mean that air conditioners are used a great deal in summer. In the cooler climate areas of Tasmania for example, in the winter once again air conditioners are used a great deal, this time to heat the home. When building a new home there are many different ways that your build design can help both keep your home cool in summer and warm in winter, this is known as passive design building principles. However for those of us who are already in our homes, there are still ways that we can reduce the amount of electricity that we use for heating and cooling. How to save electricity used for heating and cooling can be quite simple and very effective. In both winter and summer when the temperature is really unpleasant draw your curtains and blinds to either keep the heat inside or outside. In cold weather wear warm clothing and reduce the temperature level of your reverse cycle air conditioner. Every degree less that you set your air conditioning has means a saving on your electricity bill. Stop drafts which let cold air into your home. There are many attractive door stoppers (and some really funny ones) now on the market. Plant a tree on the western side of your home. Preferably a deciduous tree. In time this tree will provide shade over the hottest period of the day in spring and summer. In winter, once it has dropped its leaves it will allow the warming winter sun into your home. So planting a tree in the right position can help reduce your electricity expenditure. External awning on western windows for those homes in the topics or semi-tropical areas are highly effective in reducing the temperature of a home. As the blinds do not allow the heat onto the windows, these western rooms will be much cooler than previously. If you have zoned air conditioning or several split systems, heat or cool only those areas of the home that you are actually using. You can save a very large amount of electricity this way. If you really want to know how to save electricity then we believe (or hope) that this advice provided by a Brisbane electrician has been of some assistance to you.